Complexes are an effective way to train, since they boast all the benefits of traditional strength training with the added perks of cardiovascular conditioning and fat loss. Because you flow the movements by using the same weight throughout each one, complexes boost muscular endurance, which means you’re training muscles to repeatedly exert force against resistance. Complexes are great for everyone from the average gym-goer to the competitive athlete. You can accomplish so much in so little time. We have designed this full-body complex using dumbbells. You can perform each of the following complexes on its own as a mini-workout — try one when you’re short on time or as a “finisher” at the end of a workout for added conditioning — or string them together. Either way, this workout will leave you sweating, breathing hard, and feeling strong. Perform three or four rounds of each complex, resting 60 seconds between rounds. Before moving on to the next complex, rest as needed. 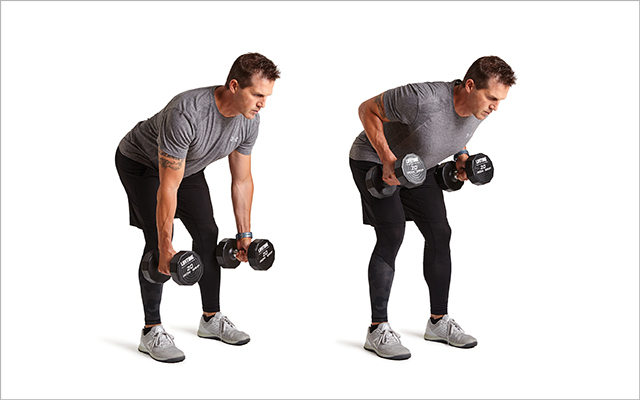 For each complex, use the same set of dumbbells for all three movements. The most challenging exercise in the complex will determine the weight for the entire complex: Choose a weight that allows you to complete 10 to 12 reps for three or four rounds. For instance, in complex 1, the clean will be your limiting factor. Select the weight that is appropriate for cleans throughout the rounds, and use that same set of dumbbells for the Romanian deadlift and row. This series works pulling patterns in the upper and lower body. The Romanian deadlift and bent-over row improve strength throughout the posterior chain, while the clean builds power in the hips. 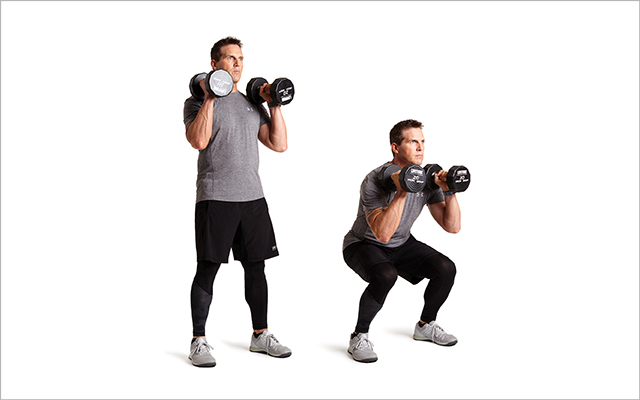 Standing with feet at shoulder width, hold two dumbbells directly in front of your thighs, palms facing your thighs. Keeping your weight in your heels, inhale as you hinge at your hips with a slight bend in your knees as you lower the dumbbells toward the ground. Your shins should stay vertical and back should stay flat. Exhale as you drive your heels into the ground and extend your knees and hips to rise to standing. To initiate the movement, brace your abs and hinge your hips back, rather than simply bending or rounding forward. Keep your arms close to your body throughout the exercise. Each time you return to standing, squeeze your glutes. Maintaining your shoulder-width stance, bring the dumbbells to your sides so that palms face your body. Then hinge at your hips to fold forward so your torso is parallel to the ground. Keep your back flat and keep weight in your heels so you feel your glutes engage, knees can bend softly. Exhale as you pull the weights up toward your torso, keeping your elbows close to your body. At the top position, squeeze your shoulder blades together and pause briefly. Inhale as you slowly lower the weights to the starting position. To begin, hinge your hips back as if trying to tap a wall behind you. Brace your abs and keep a soft bend in the knees to support your lower back. Draw your shoulder blades away from your ears as you row the dumbbells toward your hips. Maintaining your shoulder-width stance and holding the dumbbells at your sides, bend your knees and push your hips back, lowering the dumbbells toward the floor. Rapidly jump upward by extending your hips and knees to move the weights upward. Palms should continue to face inward. After fully extending, bend your hips and knees and let your arms bend to “catch” the weight in a squat position with the dumbbells at your shoulders. Extend your hips and knees to return to standing with the weights on your shoulders. Use power from your hips — not your arms — to explosively jump the dumbbells from below knee height to your shoulders. 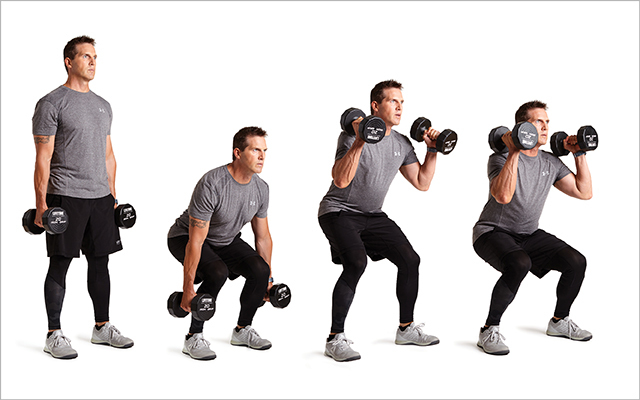 “Catch” the dumbbells at shoulder height in a partial squat (typical with heavier weights). Stand up completely between lifts. This series works pushing patterns in the upper and lower body. 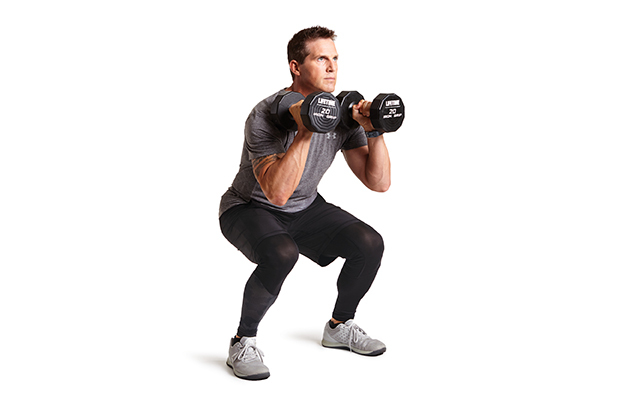 The front squat builds leg strength with an upright posture that trains stability in the core. The curl and overhead press are classic moves to strengthen your arms and shoulders. 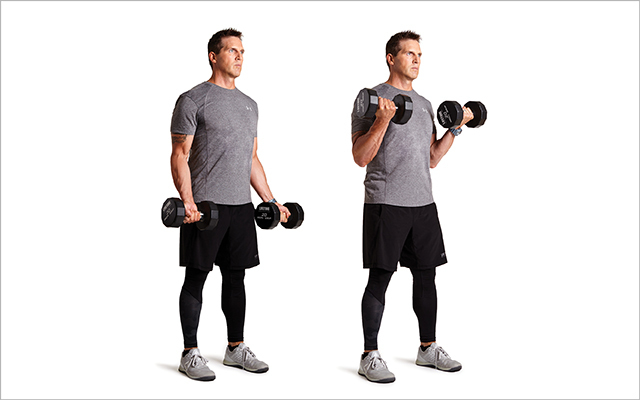 Stand holding a dumbbell in each hand at shoulder height with your elbows by your sides and palms facing inward. Keeping your weight in your heels, inhale as you push your hips backward and bend your knees to lower into a squat. Keep your torso as upright as possible and do not allow the dumbbells to move from their initial position. Exhale as you extend your knees and hips to rise to standing. Keep your abs braced and chest tall and proud throughout the movement. Squeeze your glutes each time you stand up. Lower the dumbbells so your hands are at your sides, palms facing away from your body. Exhale as you bend your elbows to curl the weights toward your body. Inhale to lower the weights to the starting position. Draw your shoulder blades down away from your ears. Keep elbows tucked close to your ribs as you curl the weights up. Avoid any extra jerking to raise the weight. 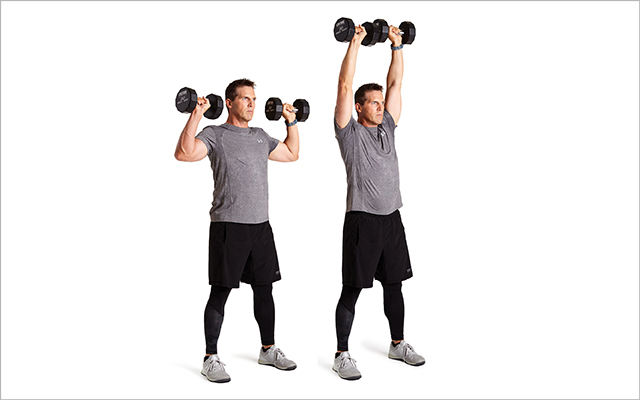 Continue holding the dumbbells at shoulder height. Exhale as you press the weights overhead, making sure to keep your ribs stacked over your hips so your back doesn’t arch. Inhale as you lower the weights back to shoulders. Choose one of two hand positions: palms facing out (pictured) or toward each other. Avoid scrunching the shoulders or arching your back to press overhead. 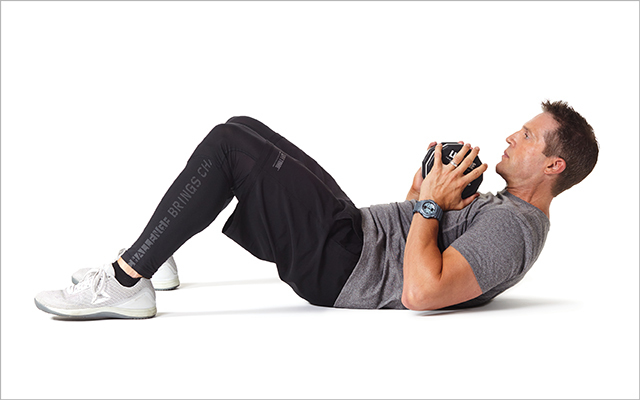 This series works the entire core, including the deep abdominal muscles, hips, and glutes, from a supine position. 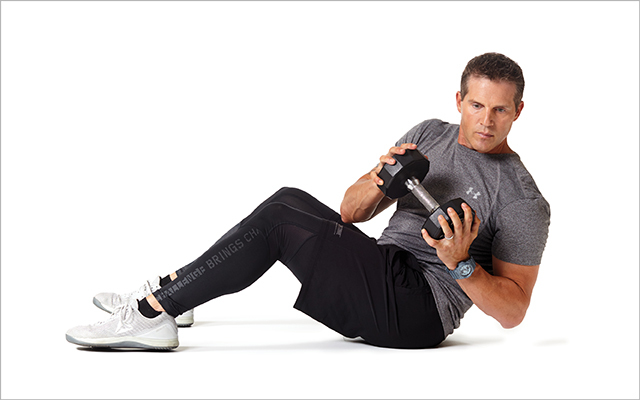 Lie on your back with knees bent and hold one dumbbell at your chest. Exhale and tighten your core, then slowly begin to roll your shoulders off the ground while your lower back remains grounded. Your belly should stay tight and flat. Pause briefly at the top. Inhale as you slowly lower yourself back down to the ground. Raise your shoulder blades fully off the floor with each rep to work the core and protect your neck. Sit on the floor, leaning partway back at a 45-degree angle, with your back flat and torso and thighs forming a V shape. 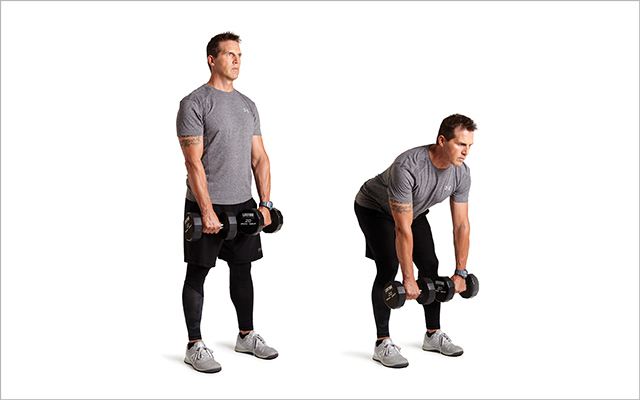 Hold the dumbbell in front of you, either close to your chest or with arms extended straight ahead. Exhale as you rotate to your right, twisting through the torso. Then, inhale to rotate through the starting position, and, holding your torso steady, exhale to rotate to the left. Inhale as you rotate back to the starting position. Alternate sides to perform a total of 12 reps. Allow your chest — rather than your head or hands — to lead the movement in order to get a full rotation through the torso. Lie on your back and bend your knees so that your feet are flat on the floor, directly beneath your knees. Rest a dumbbell on your pelvis. Exhale, squeeze your glutes and brace your abs, then press your heels into the ground to lift your hips until your body forms a straight line from head to knees. Inhale as you lower your hips to the ground. Keep your back straight and brace your abs while squeezing your glutes. Avoid arching your back as you raise your hips.